On our first day in Tuscany, my sister drove and I navigated. Between giving her the next directions (3 more kilometers on this road and then turn left) and catching up on stories about our kids, we were gasping at the scenery. Vineyards and towers on hills and cypress trees and red poppies and oh so beautiful. …in an incredibly special place. Hello gorgeous views from the windows of our room. We flung open all the windows and stuck our heads outside to take it all in. 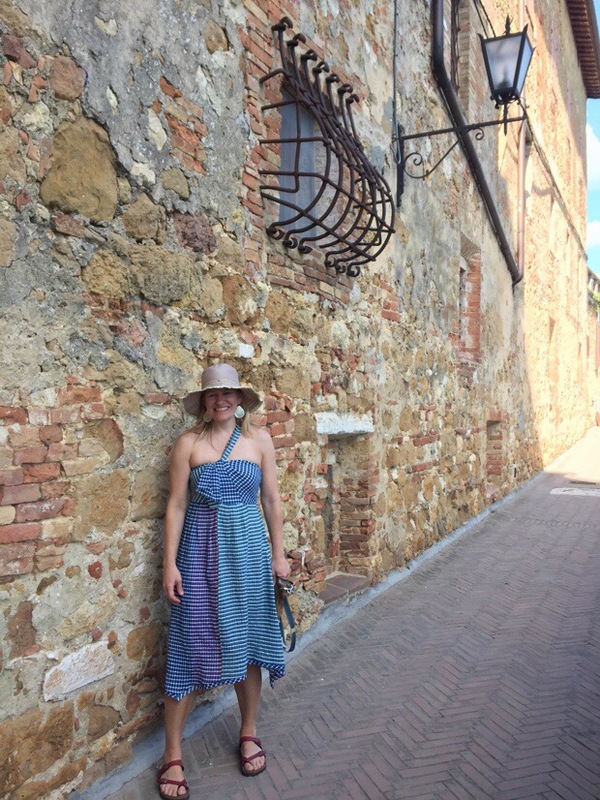 I could not have been more thrilled with my sister’s first taste of Italy! After settling in, we went down to the restaurant where we had lunch outside. 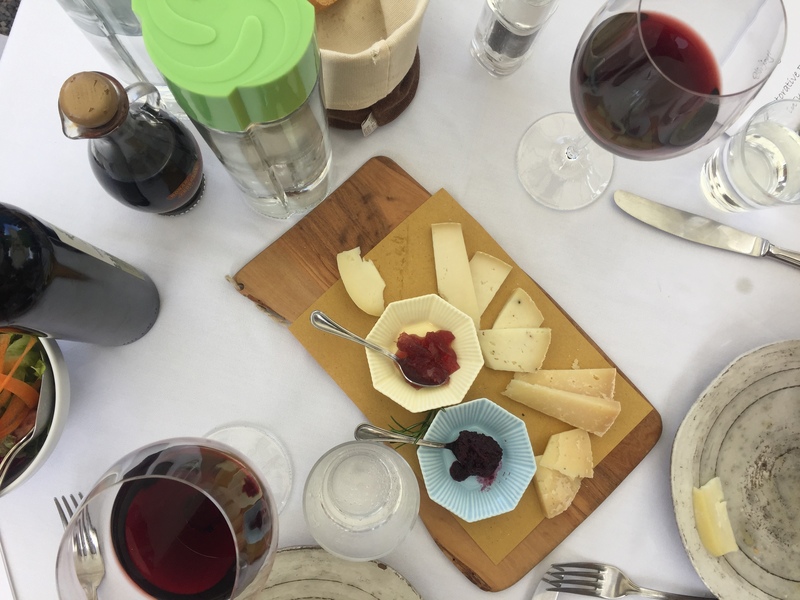 We ate the first of many meals on Tuscan pottery and had the first of many conversations with our fellow travelers. After lunch we explored the property a bit, walking a trail to nearby Trequanda. You follow a dirt lane through olive groves. Tiny olives were growing on these silver leafed trees. Since Anna had just flown in from Chicago, she was trying to stay awake, so we kept moving until it was time for evening yoga outside on the grass, when she finally fell asleep. After a nap and a shower, we gathered again with everyone for dinner, which we had around a large table. All week long we had dinner together and were served homemade pasta dishes by the most attentive waiters, who graciously answered all our questions about the food and wine. We fell asleep our first night in Tuscany with full bellies and hearts. The next morning we gathered after breakfast in the wine cellar for yoga with Jane. Jane was the leader of the retreat in Italy, and I had only met her online previously, so it was so fun to meet in person and to benefit from her many years of teaching yoga and meditation. Our classes were gentle and lovely, just like the rolling hills around us. We gathered a couple of times a day for yoga and meditation at different spots on the property over the week. I loved the rhythm of breaking up days of sightseeing with these morning and afternoon sessions, making space to absorb the experience of travel. Each day brought its own simple but new adventure in Tuscany. 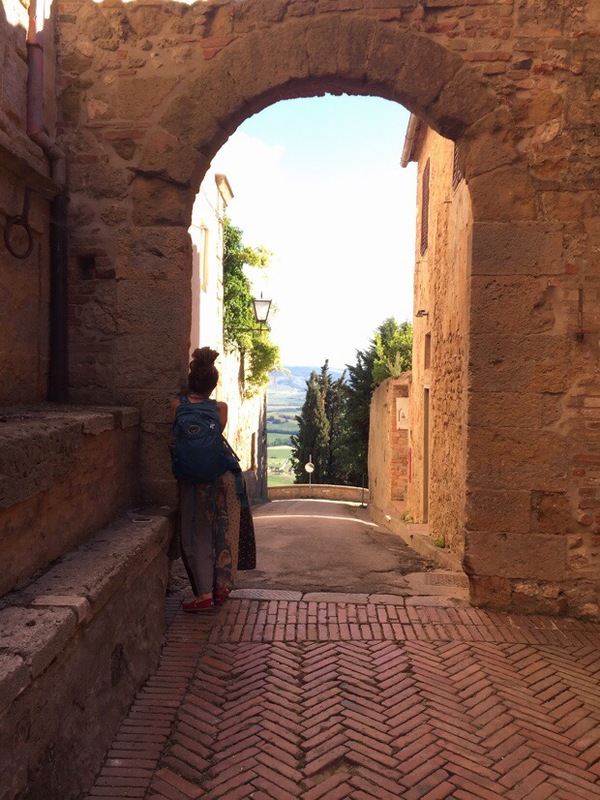 We spent one afternoon in Pienza. 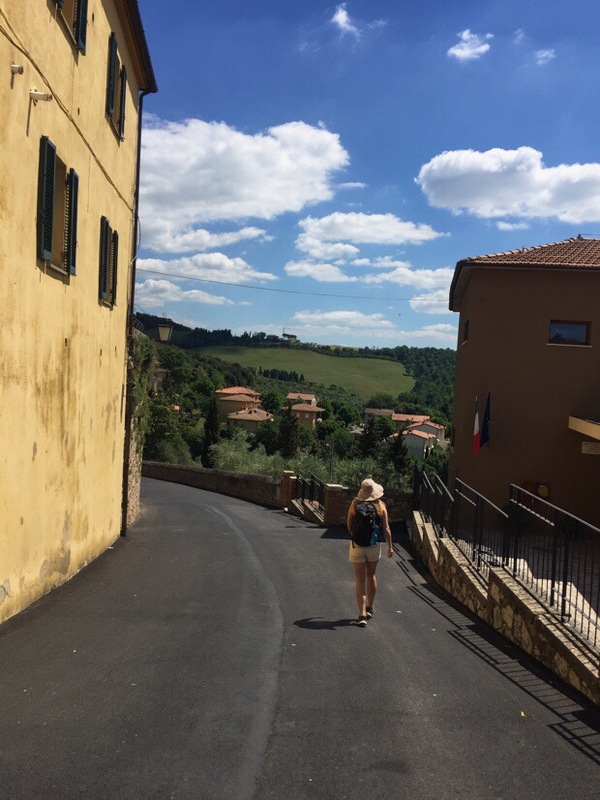 Anna and I loved walking these Tuscan hill towns. She went in all the shops while I walked around taking photos. 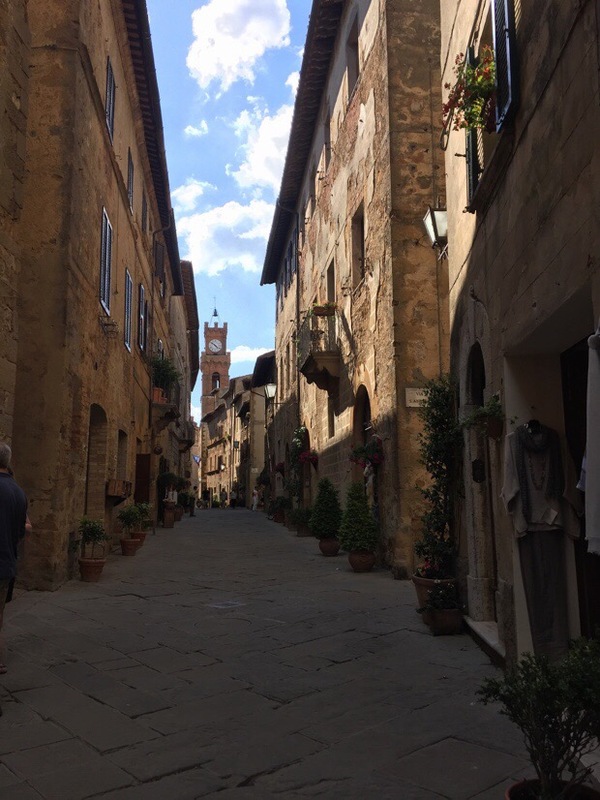 Pienza is the home of Pecorino cheese. If you walk around the shops, you can taste the varieties of fresh and aged Pecorino. 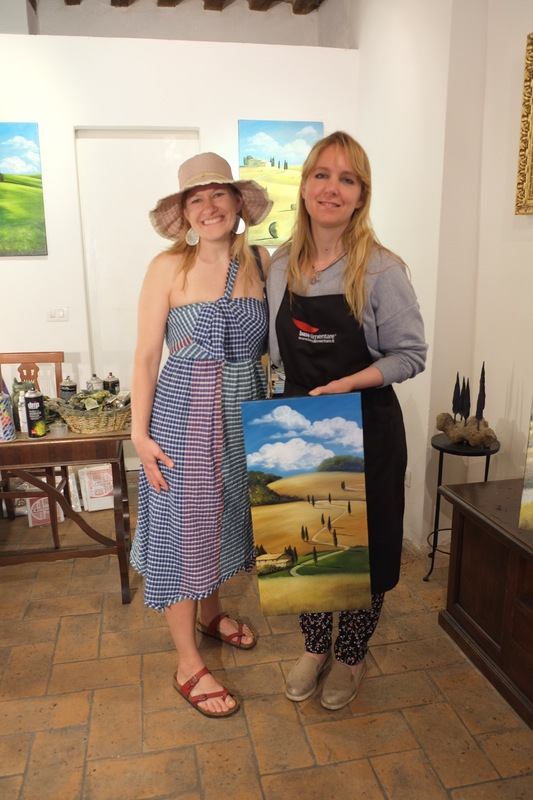 My sister bought a gorgeous painting from a small local gallery in Pienza. The artist was delighted and even took the canvas off the frame to roll and bubble wrap it for the trip home. I love that Anna always finds local art when we travel. She bought paintings from an artist in Paris last year, and at the end of our week in Tuscany she found some pottery bowls from the region. After shopping and walking, always, always, we had gelato. Favorites of the week in Tuscany were white wine and lemon. Other food highlights included pizza in Trequanda, the small town near our villa. Wine tasting at the vineyard. And making homemade pasta with our chef, which we ate for dinner that night. 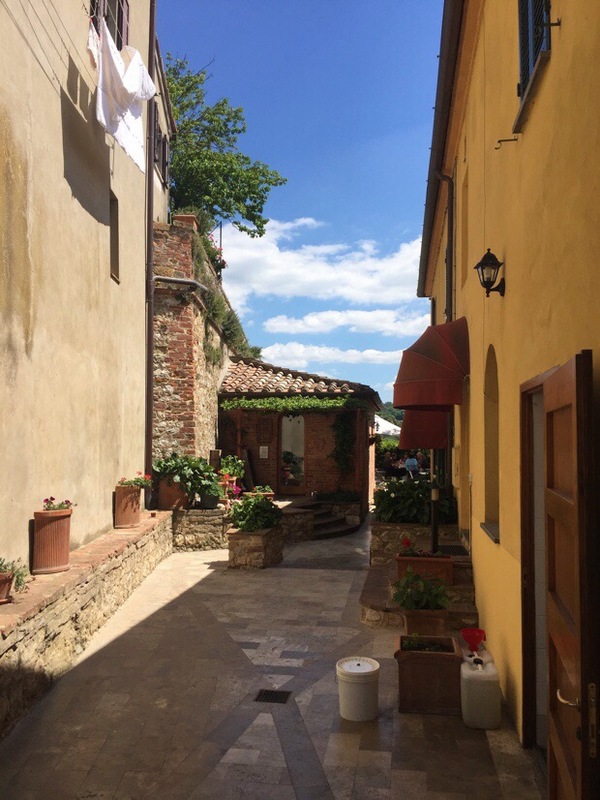 We had breakfast and dinner at Fattoria del Colle every day, so sometimes we went out for lunch. And sometimes we put lunch together in our room. One afternoon we borrowed the bikes available for use at the villa and went riding through the vineyard lined roads. I was constantly stopping to take pictures of rows of cypress trees. Another day we walked to the local church to light candles. 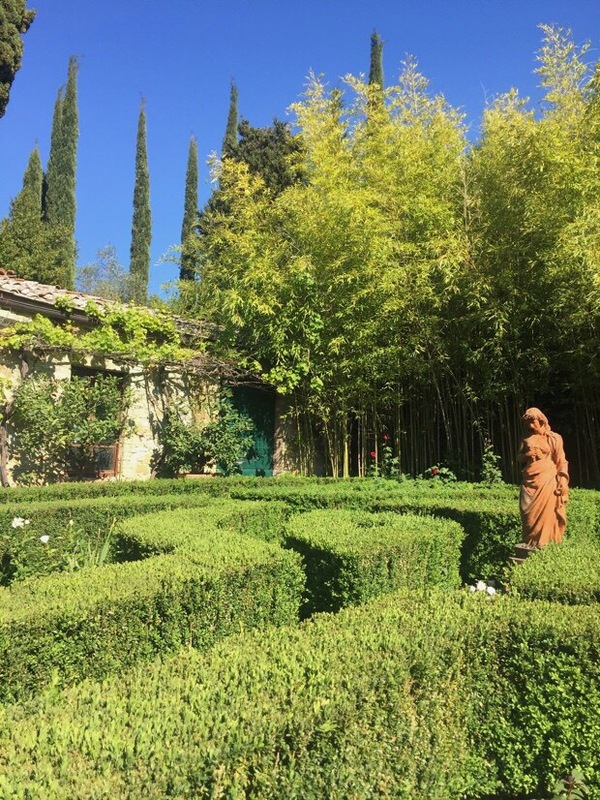 My favorite moments were probably the ones we spent sitting around the gardens at Fattoria del Colle. I loved connecting with so many lovely people. The people on the retreat and the people working at the villa. The owner, Donatella, lives right in the middle of the property. We got to see her home and sit in her chapel, and hear the story of how she broke with the tradition of having only male wine masters. Our favorite wine was her Prime Donna Brunello, which is chosen by a group of ladies every year. It was divine. Many bottles were ordered and sent home by gals on our retreat. 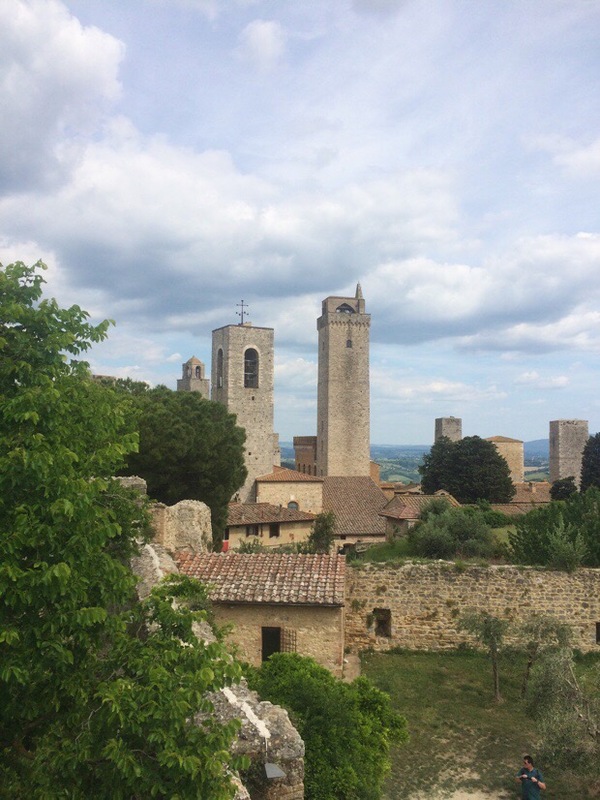 Anna and I also spent a day seeing San Gimignano, a hill town that holds a special place in my heart because it was the first one I ever visited. Taido and I walked through this town together in 2004. It was on my list of places to see after I saw it featured in the film Tea with Mussolini. Then, I got to take Mary Polly here in 2012, while we were cruising around Europe. So it was super fun to go back with Anna and go to the same gelato shop and walk the same city walls and gardens. 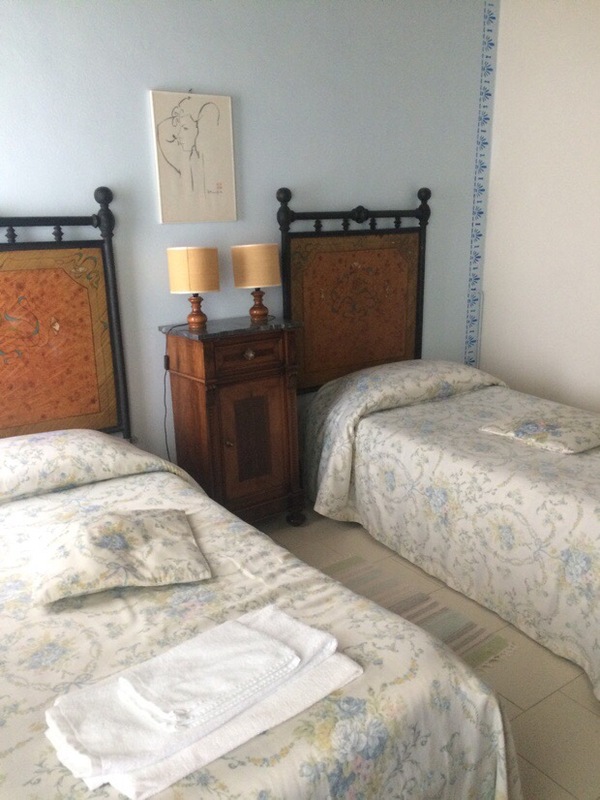 On the beautiful drive over, we dreamed about all the ways we might come back to Italy in the years to come! I’m so grateful that Anna came to meet me in Italy and that Jane invited me to come on her retreat! 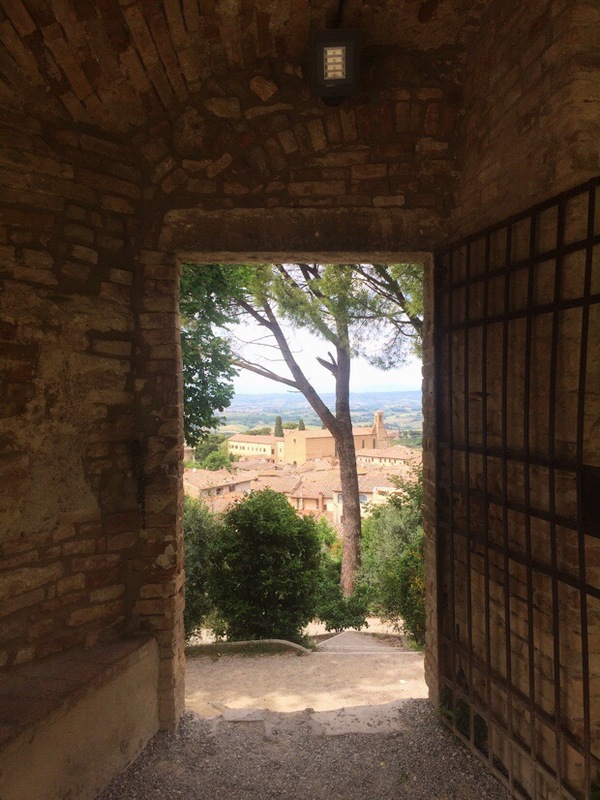 It was a dreamy week under the Tuscan sun. I have big silly grins in every photo. We said a sweet Ciao, Ciao to our new friends and to La Dolce Vita in Tuscany and headed off to Rome to do a bit of sightseeing before Anna had to fly away.